Mix the tahini dressing together, adding a little hot water if too thick. Stir a little of the dressing into the salad until coated. 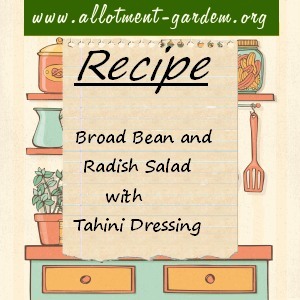 The Tahini dressing will keep for 1 week in the fridge. With older broad beans, blanch for 2 minutes and then, when cooled down, rub gently to remove the skins from the beans. You really should grow your own radish, they’re so easy and even a pot on a patio can provide a supply.